Concept: Middle school students will build two simple plywood boats with the general lines of Tlingit canoes, incorporating traditional Tlingit canoe building ceremonies (where appropriate) and painted art forms. Phil Bolger's "Navel Jelly" design, an easy-to-build 31 foot canoe, would provide the substrate for Northwest coast art forms. 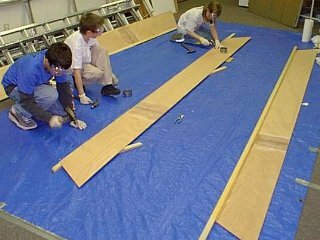 The boat itself can be easily and inexpensively assembled from precut parts by middle school students using nails and non-toxic glue. The flat sides provide an excellent canvas for 2D art forms. Designs can be incorporated on interior surfaces as well. Nail and glue, plywood over cedar longitudinal members, with five structural bulkhead/molds. 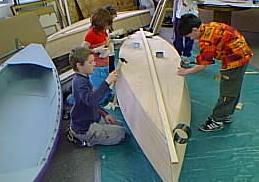 Similar construction techniques on smaller boats have been successfully built by a grade 4-5-6 class in Juneau. Built on-site on tarps for floor protection (could use commons). (Haul to commons ceiling between classes?). 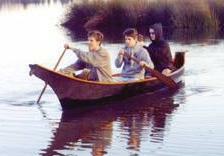 Tlingit Canoe Links, a compendium of information about other Northwest Coast canoe projects.